I lived on this stuff when I was in Europe. It's the sweet, tart nectar of the gods, as far as I'm concerned, and every swallow of this divine fluid evokes memories from long years past. Today, I discovered that the basement grocery in the building where I work is now selling Orangina, so I snapped up two bottles. I saw Orangina elsewhere, in Itaewon, not that long ago; the soda's sudden appearance in my local store makes me wonder whether we're in the midst of a tulip-frenzy-style surgissement of Orangina-ish excitement. One way or another, I must profit from this while I can, so for the next little while, I'll likely be eschewing my usual poisons to come back to one of my first loves... at least until the grocery stops selling it. Back in the day, Orangina used to be sold in grenade-shaped glass bottles. In the late 80s, those bottles had metal twist-off caps. The bottle you see above hints at the original shape, but everything is plastic, now. Luckily, the flavor of the drink is the same; it's pretty much what I remember. 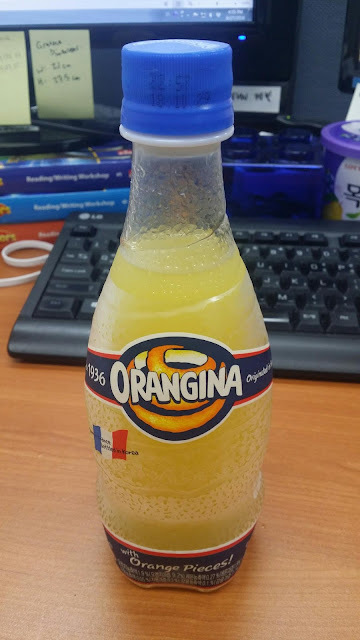 Some might find Orangina too tart and acidic for their tastes, but I can't get enough of it. The Korean designation for the drink is "오랑지나"—"oh-rahng-jee-nah," with no real attempt to simulate the French pronunciation (gird yourself for a truly French commercial). Not that I care; I'm just happy to see an old friend again. Does it come in vegetable juice flavor? Vegina? *groan* at that pun above. It was still in those glass bottles in those days, though I think it also came in cans, for a while anyway. This is my first time seeing it locally, and I suspect it's going to disappear from my grocery's shelves soon enough. Everything I like gets taken away eventually, dammit. It's the Jack Bauer curse: the universe doesn't want me to love anything.